While her life seemed to be pulling her under, Kasienka found a way for her passion to keep her floating. Armed with a suitcase and a ratty laundry bag Kasienka and her mother, Ola, head to England in search for the husband and father who abandoned them. Kasienka is dragged around while her mother, who is very emotionally distraught, is determined to find her husband. Loneliness begins to grow on Kasienka until someone special swims into her life and helps her stay afloat. 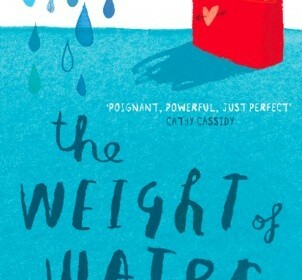 Crossan’s The Weight of Water brought me to cry, laugh, feel irritated, and smile as I enjoyed how Kasienka struggled to find her way through an unknown country. Coming from Gdańsk in Poland, England is a whole new world for Kasienka and her mother to understand. They live in Coventry in an awful and small studio lacking of all the qualities that create a comfy home. Kasienka, who is renamed Cassie by her teacher, is placed in the 6th grade, although she is twelve, just because of the fact that she can not read English as well as the others. Her mother becomes a maid at a hospital which provides just enough money for food, but little else. Eventually, Kasienka’s teacher realizes her mistake and moves her up to 7th grade. Kasienka thought that this switch would be the greatest thing to have happened since her move, instead it throws her into complete agony. In the 7th grade she is bullied by Claire and her minions, and to make it worse, her mother has decided that they will travel all over Coventry in hope to find her missing husband. Kasienka is pulled all around by mother to the point when she realizes that perhaps her father does not want to be found. Finally, Kasienska’s horror of a life begins to look a little brighter when she finds a pool where she can let go and pursue her old passion, competitive swimming. This passion brings along William who becomes her friend and later a little more. Although he’s in the 8th grade, he helps Kasienka defeat her bullies, enjoy swimming again, and leave the constraints of being mama’s good girl. Without Kasienka does Ola ever find her “lost” husband and does she deep inside know why he left? The Weight of Water brings up the good question, do all those who seem to be lost want to be found? Although Ola’s one and only reason for enduring their horrid life in Coventry was to go and find her husband, he must have left his family in Poland for a reason. This novel is written in free verse and resembles the style of a diary with Kasienka seemingly the writer. With the novel being written in this format it helps the reader understand how wretched life for Kasienka was and fully understand all her feelings regarding her new life. It creates a doleful mood throughout the story and allows for a great understanding of the setting and characters. The setting is almost always in Coventry which Sarah Crossan describes as a dreary and muggy city with limited liveliness. The characters are each very unique with Kasienka being very slender, too white, and too Polish. Claire and her minions on the other hand are petite, have long straight hair, and are very typical English girls finding ways to push Kasienka away. Crossan’s novel while bustling with action also has detailed characters and a depressing yet descriptive setting. Sarah Crossan’s The Weight of Water had me fully enthralled. I saw the true pain of being the odd one out through an interesting perspective, was able to understand the awful suspense of searching for someone through a set of heartbroken eyes, and enjoy an ending that brought everything to a full close. This story is for anyone ready to let out all their emotions and enjoy someone else’s adventure as I did. Kasienka will relate to anyone who has had to start over, fix the past, and face problems head on even if it creates a splash.